F1’s TV graphics changed quite a bit this year. Everything is now shown in the official Formula 1 typeface, the onboard display now loops around the Halo, and FOM have added a few new ways of displaying information, such as possible pit strategies or comparing corner speeds. There were also those massive CGI Heineken stars at a few races, but we don’t like to talk about those. 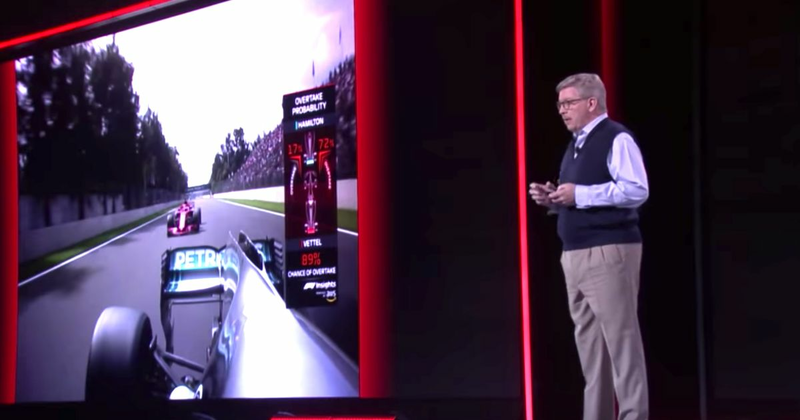 In 2019, the F1 TV graphics package will be getting some new additions, which Ross Brawn previewed during an Amazon Web Services conference. The first of which is an analysis of the tyres, which will display whether or not they’re overheating and the possibility of the driver being able to deal with the situation. The second looks at the probability of an overtake. What chance will a chasing driver have of making a move? Which side will they try and make the pass on? How risky would an overtake be? The third takes a closer look at strategies, predicting whether a driver will come out ahead or behind a rival and whether or not a driver is on the right strategy. The whole thing is based on machine learning, which will try to provide fans with the kind of information typically only reserved for teams as a way of making the sport more transparent. “Further down the road what’s really exciting is we’re going to investigate the influence of the tracks and the racing formats on the quality of the racing. Can we create tracks that achieve better racing and better overtaking? Can we build models to allow us to do that? Can we change the format of racing to make it more exciting and less predictable? You can check out what some of the new visuals could look like in this video (skip to 1:45.50). Innovations like this are usually a good thing - as long as they work properly, anyway. And hey, even if they don’t, we get hilarious moments like the Lastname vs Lastname battle. As with any new tech, there are always potential issues. In this case, one could be that if fans are privy to too much information - and that information is accurate - then the sport could risk losing the element of the unknown, which is a big part of what makes F1 so exciting in the first place. The question is whether fans will appreciate that level of insight as an unavoidable default option, rather than making it available to those who want it through a separate app, or the F1 TV service.